Wedding Hair & Makeup // Guest, Bride, Bridesmaid! I was recently asked to create some content for the Bonprix website around weddings and bridal hair/makeup and today I get to share with you the looks I created, If you are off to a wedding soon and are stuck for some hair and makeup ideas then check out my videos on the Bonprix YouTube channel here. If you are a bride to be and looking for some inspiration check out the Bonprix wedding hub, there you can find lots of inspiration and view the wedding shop, lingerie, my videos and also get your very own wedding checklist to make sure you haven’t missed out anything important planning a wedding can be super stressful so having one place to view everything is fantastic. For the makeup look I went with rose golds and so pinks, very pretty shades and long lasting products. I used the Naked 3 palette on the eyes so if you are looking for a quick and easy tutorial then I’d recommend checking this video out. 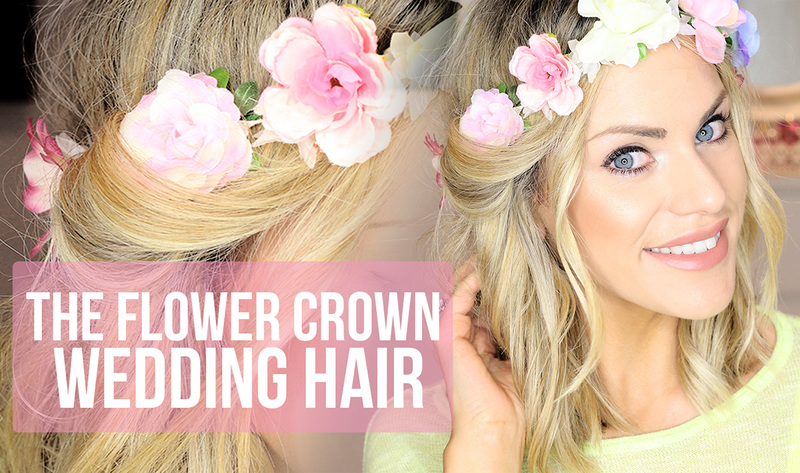 For the hair tutorial I wanted to add a floral crown for that extra boho chic style, I think this is a super easy hair look that looks very effective and perfect for those on a budget, this would look amazing on Bridemaids and brides super pretty. Are you off to a wedding soon, or planning your own? I’d love to know how it’s going! Next Post 6 Things that Make me Feel Amazing!